Melbadeen Downing, 87, Greentown, passed away at 8:30 p.m. on Saturday, August 4, 2018, at her home. She was born October 28, 1930, in Greentown, to Sherwood E. and Zola (Lee) Foland. On September 10, 1948, she married Max Eugene Downing, and he survives. Melbadeen graduated from Union Township High School in 1948 and spent her life working on the family farm. She enjoyed quilting, spending time with family and spending winters in Ft. Myers, Florida, for 29 years. 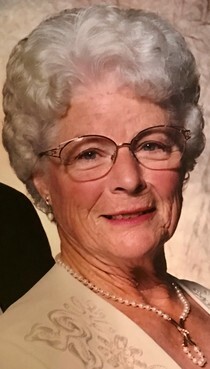 In addition to her husband, she is survived by her daughter, Patty (Frank) Wedemeier, Sugar Land, Texas; sons, Stanley (Robin) Downing, Greentown, and Bryan (Sergio Nanez) Downing, Austin, Texas; grandchildren, James (Cathy) Wedemeier, Sugar Land, Texas, Rachel (Ryan) Sims, Sugar Land, Texas, Anthony (Nicole) Downing, Greentown, Michael (Heather) Downing, Peru, Brandt (Sarah) Downing, Kokomo, Bradley (Marsha) Downing, Greentown, and Jason (Pam) Downing, Greentown; 15 great-grandchildren; and sister, Melinda Metz, Ft. Myers, Florida. She was preceded in death by four brothers and four sisters. The family would like to express special thanks to Kindred Hospice and Megan Burr for their loving care. Funeral services will be held at 11 a.m. on Wednesday, August 8, 2018, at Hasler-Stout Funeral Home, 112 E. Main St., Greentown, with Pastor Joe Coffin officiating. Burial will follow in Greenlawn Cemetery. Friends may visit with the family from 4 to 8 p.m. on Tuesday at the funeral home. Memorial contributions may be made in Melbadeen’s memory to CSI Ministries Jamaica. Messages of condolence may be left online at www.hasler-stout.com.